Laurel Downing Bill is a third generation Alaskan who was born in Fairbanks in 1951. She spent her childhood in Juneau, and then traveled to Africa, Asia and Europe with her parents as her father worked for a company that built roads and bridges around the world. All this traveling opened the author’s eyes to other cultures and to world history. At the age of 19, Laurel Downing Bill came back to Alaska, married and had 2 children and a foster daughter. 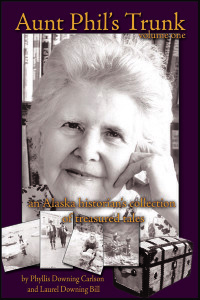 In 1993, the author inherited her aunt Phyllis Downing Carlson’s research and books on Alaska. Her aunt was a respected historian and librarian in Anchorage. Laurel Downing Bill didn’t want all this research to go to waste, so she decided to write about the history of Alaska, but she thought she lacked the necessary knowledge to write properly. So she went back to school in her late forties to study journalism with a minor in history. 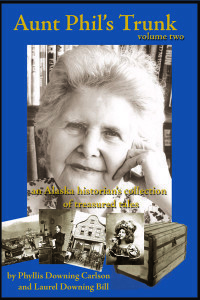 If you like the first 2 volumes, there is a volume 3 (from 1912 to 1935), a volume 4 (from 1935 to 1960), and the author is currently working on volume 5, the last in the series, that will cover Alaska’s history from 1960 to 2000. Aunt Phil’s Trunk Vol. 1 and 2 were sent to me for free in exchange for an honest review. If you would like to win the first 2 volumes in the series, please participate in the giveaway below.